The first wireline drill rod thread was developed in the 1950's. What has changed since then and what do these developments mean for your drilling operation. This is the third article of Part 2 of our Technical Series on Drill Rod Safety. Click here for an outline of the entire Technical Series on Drill Rod Safety. It is important to note that the depth capacity calculation that appeared in the first article assumes that the threaded connections, the pins and the boxes, are perfectly cut, ie. that exactly half of the wall thickness has been removed from each connection so that the cross-sectional area of the threaded connection will be exactly half of the mid-body and therefore will be half as strong as the mid-body of the drill rod. This is an ideal which is impossible to achieve. Machining inaccuracies will remove more than half of the wall thickness and so most threaded connections are somewhat less than half the strength of the mid-body and therefore the maximum depth capacity will be somewhat less than 2 000 metres. The relationship between the strength of the mid-body and the strength of a threaded connection is called the thread efficiency. Thread efficiency is defined as how much load the thread can carry compared to the mid-body. If, for example, thread efficiency is 35% then, the maximum depth to which the drill rod, in the example in the first article, can be used will 35% of 4 000 = 1 400 metres. A perfectly cut thread can only have a thread efficiency of 50% - thread efficiency cannot be greater than 50%. The original “Q” series wireline drill rod designed by Boart Longyear in the 1950’s was the only wireline drill rod available for nearly 3 decades. This thread has an efficiency of approximately 35% and so the depth capacity of the “Q” series drill rods was therefore only 1 400 metres. Many drilling projects however, required that boreholes penetrated to depths deeper than was achievable with standard “Q” series wireline drill rods and so a few manufacturers began to develop drill rods that could safely drill to a greater depth than was possible with the “Q” thread. Use higher grade material to manufacture the drill rods, i.e. material with a higher Yield and Ultimate Tensile Strength. ii. Increase the width of the flank by increasing the wall thickness at the joints. 3. Improve the strength characteristics of the threaded ends. Higher grade (stronger) tubular materials can be used but they are generally much more costly and the added strength is achieved by compromising other properties of the steel. In the late 1980’s JKS Boyles, a Canadian manufacturer, began the development of a new wireline thread that they called the “T” thread (they called the new drill rod “Tuff rod”). JKS Boyles improved the thread efficiency by improving the design of the thread and by improving the strength of the threaded ends by applying a heat treatment process to the ends of the drill rod. The result was a drill rod with greater depth capacity and improved wear characteristics than the original “Q” rod. The “T” thread is about 45% efficient which means that it can safely be used to approximately 1 800 metres, (45% of 4 000 metres). As a result, “Tuff rod” became a standard in South Africa and use of “Q” rod was confined to shallow boreholes only. It is important to recognise that JKS Boyles used standard SAE 1541 grade material for their Tuff rod – the increased depth capability was purely a result of the improved thread design and the heat treatment of the ends of the drill rod. They have further increased the strength at the threaded connections by heat treating the ends of the rods. The Yield Strength of the threaded ends of the Boart Longyear RQ rod has been increased to a claimed minimum 1034 MPa which means that the drill rod has a claimed depth capacity of 3 300 metres. There is no question that the RQ drill rod is exceptionally strong and many contractors have successfully achieved the rated depths of the rod. In response to Boart Longyear’s RQ thread, Atlas Copco launched their “MO” drill rod to challenge Boart Longyear’s dominance of the deep-hole drill rod market. They have used a similar approach to Boart Longyear and have modified the thread profile, used a higher strength tube and they heat treat the ends of the rod. It is interesting to examine how Longyear and Atlas Copco have modified the original “Q” thread design. Figure 1 shows the profile of the “Q”, “RQ” and “MO” threads. The flanks of the threads carry the tensile load – the flank carrying the load is called the “pressure flank”. Figure 1 shows that in the original “Q” thread, the pressure flank is tapered downwards and it seems clear that the thread would deform relatively easily when under tensile load. In designing the “RQ” thread, Boart Longyear have created a “reverse buttress” at the pressure flank to resist deformation of the box when under high tensile loads. Intuitively, one would expect this thread to deform at a much greater load than would be the case with the “Q” thread. 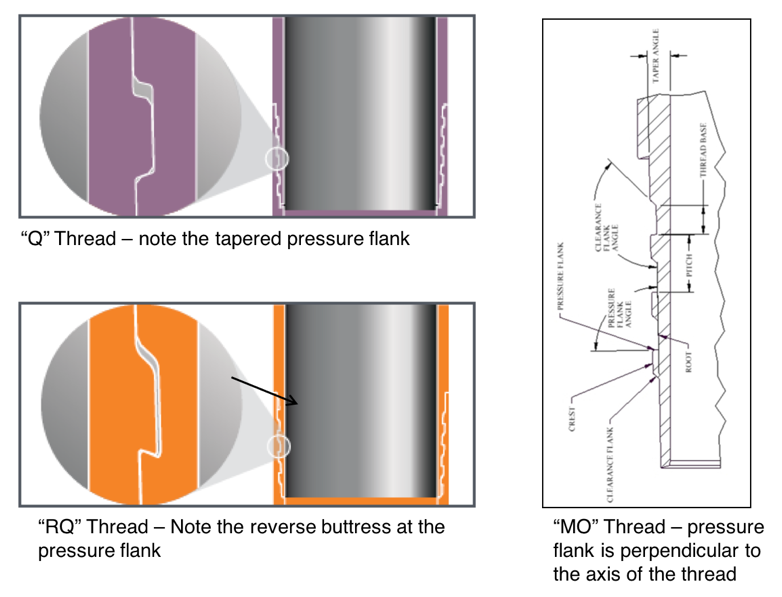 It seems that the only option left to Atlas Copco when they designed their new drill rod was to make the pressure flank perpendicular to the axis of the thread and so, the Atlas Copco “MO” thread has a square pressure flank. It is very important to remember that the Boart Longyear “Q” thread was copied by many manufacturers but the letter “Q” was copyrighted by Boart Longyear! This meant that other manufacturers could copy the thread design but they could not use the letter “Q” to market their drill rods. These companies had to therefore come up with other terminology to describe their “copies” – Atlas Copco used the letter “O” and so they sold BO, NO and HO drill rod as opposed to BQ, NQ and HQ drill rod. The “Q” and the “O” threads are therefore essentially the same thread and therefore interchangeable – theoretically!! No wireline threads are standardised and so each manufacturer machines drill rods according to his own drawings and gauges. It is therefore advisable to NEVER mix drill rods from different manufacturers. Click here for some more tips on managing your drill rods from MBI Drilling Products. The similarity between the “Q”, “RQ” and “MO” threads has created a very serious problem for the exploration industry – to an untrained eye, the “Q”, “RQ” and “MO” threads look very similar and hard to distinguish and so the possibility of mixing drill rods exists. If threads were mixed, the strength of the connection would obviously be seriously compromised and so contractors must take extreme care to ensure that drill rods are not mixed. To help prevent mixing of drill rods, Atlas Copco machine two shallow grooves in the mid-body at the pin thread to identify their “MO” thread. The “T” thread is visibly longer that any of the other wireline drill rod threads and so it is impossible to mix “T” drill rod with other wireline drill rod. The genesis of wireline drill rods from “Q” to “T” to “RQ” and “MO” has allowed contractors to safely achieve progressively greater depths at only marginally increased cost but it seems that we have reached an engineering limit and so it is unlikely that any manufacturer will further develop wireline drill rods using standard materials. The strength (Yield Strength and Ultimate Tensile Strength) of the material used to manufacture the drill rod. The design of the threaded connections. The accuracy of the machining of the threaded connections. Once the drill rods reach the contractor, a host of operational practices will then also affect the depth capacity and longevity of the drill rods – the cleanliness of the threads, the make-up torque applied to the joints and the level of care of the drill rods are some of these factors. The level of skill, care and attention that is required to accurately machine a wireline thread onto a blank steel tube cannot be overstated and very few manufacturers have the equipment or the quality control systems to consistently machine high quality threads. Many manufacturers do not possess original thread gauges and so machine threads from a “copy” of a thread, designed by another manufacturer are used. It is not possible that these threads can be as consistent and so contractors (and mining companies) should be careful not to mix drill rods from different manufacturers because the strength and therefore the safety of the drillstring will be compromised. What is the link between yield strength and depth rating? Find out more about this interesting relationship here. For a thread to fail, it is necessary that the flanks of the threads are deformed to such an extent that the box and pin are able to move apart. The first wireline drill rod thread was developed in the 1950's. Find out what has changed since then and what these developments mean for your drilling operation.